Description: Embrace the timeless look of this classic pendant. 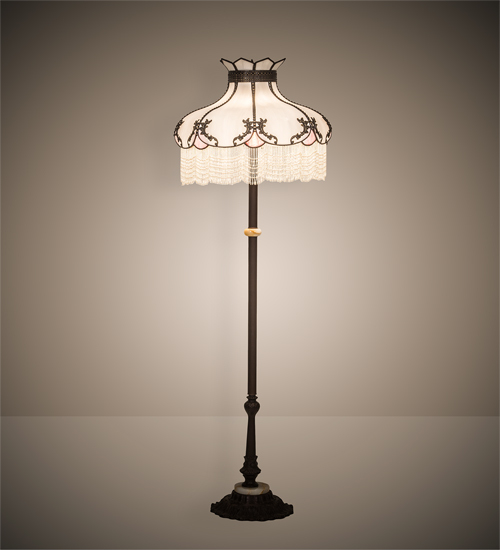 This timeless floor lamp features White hand-curved art glass with Pink scalloped designs and White hand-beaded glass fringe. Shade is enhanced with Brass filigree accents finished in Craftsman Brown, highlighted to reveal an eye-catching dimensional look. The based is finished in Mahogany Bronze. The Quality Bent Glass division of Meyda is over 100 years in the making & still creating timeless masterpieces using tools and methods from the days when we supplied Tiffany Studios. Glass colors & metal finishes are customizable as each Tiffany Bent Panel lamp is handcrafted to order. Handmade in our 180,000 sq ft manufacturing facility in Yorkville, NY.